With the newly delivered Graph Maker app in Origin 2019, Origin is able to make calendar chart very easily (see below). This type of chart is useful to present data recorded in daily bases (e.g. stock price, rainfall capacity). This blog will show you how to make the graph. Before reading forward, If you are not familiar with Graph Maker app, please refer to another nice blog on how to use it. Note: If you don’t have the version 2019, please download the trial version from the DOWNLOAD TRIAL menu above. Please download the zip file. Unzip it and open the project file, find workbook Book1 under Data folder. The Original worksheet contains the daily Dow Jones index (Col(B)) from 2014 up to 2018. We apply column formula to derive the columns of Month, Year, Week Day, Week of Month from the date column(Col(A)) in the worksheet. In Col(L), we also calculate the deviation of each record to its 30-day average. You can also check the resulting graph under Result folder. Note: If the graph isn’t showing correctly, please change the system variable @NOP to 100. (Refer to this page on setting system variables) This system variable specify the maximum number of panels in the plot. With the worksheet activated, launch the app. In the dialog, assign the worksheet columns as shown below. 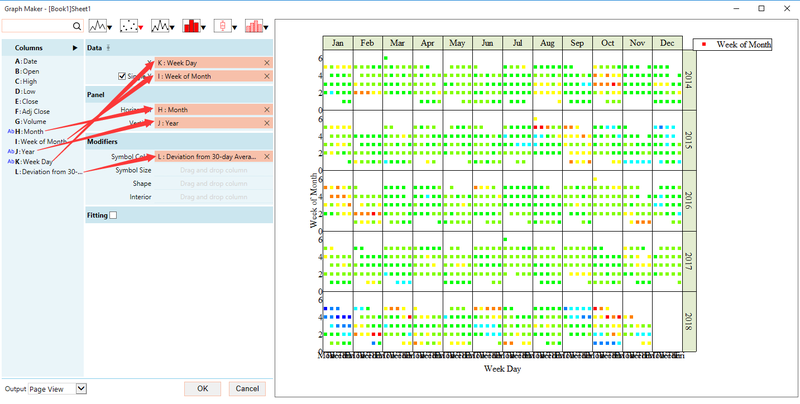 Here we take advantage of multi-panel plotting feature in Graph Maker to plot dates into different panels defined by month and year of each day. Within each panel (each month of each year), Week of Month is plotted verses Week of Day to display the graph as an calendar. 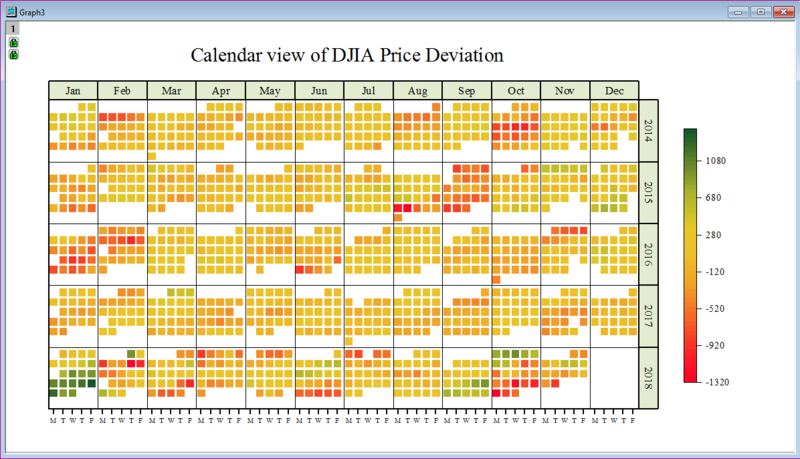 Each data point is color-mapped to Col(L), showing the daily deviation of Dow Jones index to its 30-day average. After generating the graph, you can perform the following customization to make the graph look prettier. Drag the edge of the graph layer to adjust the width and height of the graph. In Plot Details dialog, under Colormap tab. Click column header Level of the table, increase Minor Levels to 8, then click OK. Click column header Fill, change the Plot Palette to Maple. Double click on the X axis, under Tick Labels tab, Change Type to Day of week, change Display to M.
The calendar chart will look very much like the one at the beginning of the blog. You can adjust the look of the graph further as you desire.